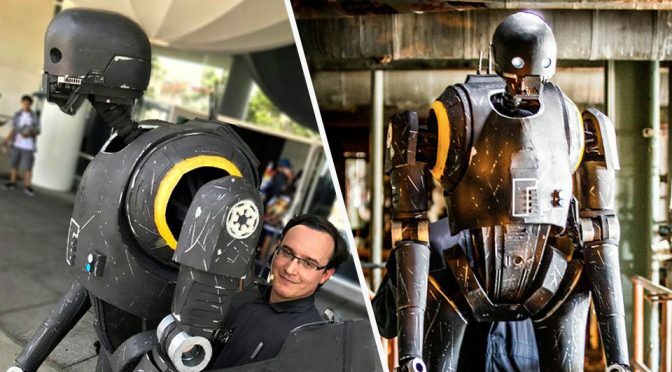 What you see here is another awesome K-2SO cosplay costume. Like the previous one we saw earlier this year, this one here is in fact a puppet and it is huge! Towering at an impressive 7-foot-2 (2.18 meters), just like the real-deal. 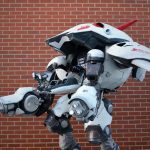 It took Darren Moser, a technical analyst by day and a cosplay costume maker by night, some serious toiling, countless late nights, months of dedication and “north of $1,000 spent to get what it is today. I can’t say which is better, this or the other. They are both equally impressive and share the same principle: puppetry. With an astounding accurate look and cleverly conceived puppetry mechanic, Darren Moser’s creation is certainly awe-inspiring. 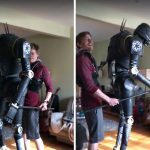 Moser’s version has a skeleton made out of PVC pipes while the ‘armor’ is carved out of EVA foam, a material commonly used by cosplay when they want to create faux armor. The head, on the other hand, is 3D printed, and it even has accurate irises that lights up like the K-2SO in the movie. We are particularly impressed by the weathering, the scuffs and all that Darren applied to his giant puppet. Similar to the one we saw in April, this one required Darren to be behind to manipulate it and as he admit, it takes quite an effort to do so. Moser, who also go by the handle Dr. Sci-Fi, plans to incorporate more mechanism in the next phase to ease the effort on his part. To overcome the line of sight issue when he is behind K-2, Moser installed a tiny camera on K-2’s cheek that will transmit live feed to an iPad stuck to Kaytoo’s back, thus allowing Moser to see what K-2 sees. The iPad also facilitates robovoice change as he speaks, so his K-2 can be more interactive. Instead of dressing in all black in the bid to be more inconspicuous while operating the puppet from behind, Darren went to length by dressing the part, so that he will appear more natural. For example, he may sometime cosplay as an First Order officer, so that when Kaytoo walks, it appears that an officer is merely following the droid. Clever indeed! Dr. Sci-Fi’s creation is so good that it did not go unnoticed. 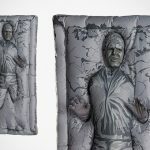 He was interviewed by Adam Savage’s Tested.com, StarWars.com and several other media outlets, and the duo even appeared at the official Force Friday II’s night festivities. 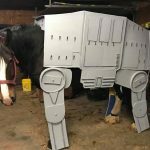 You can read in details about his creation on the man’s website, or from his interview with StarWars.com, or see it in action in video below. Images: Darren Moser/Dr. Sci-Fi/Moises Ortega Photography/JBaylon Art.